The Lunar Mission One lander deploys a robotic arm and drill on the moon in this artist's illustration. The private moon-drilling mission raised more than $1 million on Kickstarter in a crowdfunding project. 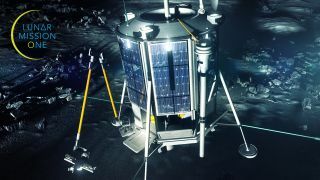 An ambitious private space exploration project that aims to land a moon-drilling probe on the lunar surface by 2024 now has the money it needs, thanks to a crowdfunding effort that raised more than $1 million for the mission. The novel Lunar Mission One project surpassed its fundraising goal of nearly 600,000 English pounds (about $945,000) this week on the crowdfunding website Kickstarter. As of the deadline on Wednesday (Dec. 17), the project has raised 672,447 pounds (about $1.05 million). The moon is one of the most well-studied celestial bodies, but few research projects have delved below the satellite's surface. Lunar Missions Ltd., the United Kingdom-based company funding the project, hopes the mission will advance understanding of how the moon formed and provide useful insights for future moon missions. "By doing this, we will access lunar rock dating back up to 4.5 billion years to discover the geological composition of the moon, the ancient relationship it shares with our planet and the effects of asteroid bombardment," the company wrote on its Kickstarter page. The Kickstarter campaign closed on Wednesday (Dec. 17), but the project had already surpassed its funding goal for the initial stages in the days leading up to the deadline. Since the probe will be removing a borehole of rock sample, it needs to refill the hole with something. That something is a digital time capsule that will contain a record of the history of life on Earth. Anyone who pledged more than 60 pounds ($94) will get their own "digital memory box" that will be buried in the time capsule. Contributors can fill their box with personal messages, photos, audio or video. People can even send a strand of their hair if they want their DNA on the moon. The company will continue selling the digital memory boxes after the Kickstarter campaign closes. Eventually, they expect tens of terabytes of data will be collected and sent to the moon. Once the hole is bored, the probe will drop in thermal sensors that will measure the flow of heat through the moon's core. The probe will also drop in a seismometer that will measure moonquakes and any meteor impacts. The mission will also determine the feasibility of using the moon as a base for long-term research projects and even as a type of manned spaceport. "Lunar Mission One will make a huge contribution to our understanding of the origins of our planet and the moon, and will inspire a generation to learn more about space, science and engineering, in the same way that my generation was inspired by the Apollo moon landings," David Iron, founder of Lunar Missions Ltd. and the Lunar Missions Trust, said in a statement.